Seafood lovers, don’t think that’s it! 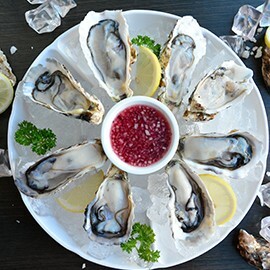 “Happy Oyster” is more than simply an oyster buffet in hotel. Listen to the grill sizzle and choose your favorite type of seafood to be cooked to perfection. Prawns, NZ mussels, seafood skewers, squid and more are ready for you! Another way to explore the treasures of the sea is with spicy Thai shellfish salad, or squid cooked with Korean gochujang sauce. A classic choice has got to be seafood tom yum, made to order. International flavors always in trend. Oven-fresh pizzas are always popular. 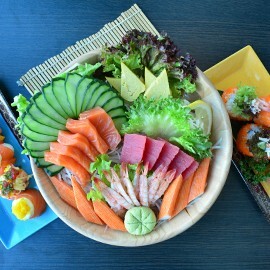 Don’t forget to treat yourself to fresh sashimi and sushi made by our Japanese chef. Chinese food is always a must at The SQUARE, with house-made dim sum and our famous Chinese roasted meat trio. 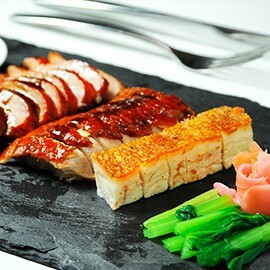 The crispy pork belly, BBQ red pork and roast duck will have you coming back for more! Dessert offers a selection to spoil every sweet-tooth. Let buffet world be your oyster! Another aspect that sets a good oyster buffet in hotel apart is the ambiance. Novotel Bangkok Platinum Pratunam’s The SQUARE offers a warm and cozy ambiance. Sofa nooks with window-side views make it a perfect date night. Ample and flexible table seating mean that big groups and families can also easily be catered to. 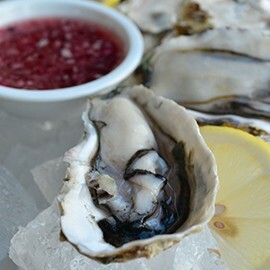 If you love oysters, then you will definitely be happy as a clam! At only THB 2,000 /person, with 50% off for direct online bookings. Available every Sunday from 12-3 PM. See more about our promotion click here.